Tupperware is a brand as synonymous with its product as Hoover, Chapstick, Velcro and Biro. For over seventy years Tupperware have been manufacturing and selling plastic storage containers and pioneered a sales method that saw plastic pots become the star of the party. In 1938 Earl Tupper invented a revolutionary type of plastic: Poly-T (Polyethylene-Tupper). After experimenting on polyethylene slag (a waste product from DuPont, where he had previously worked), he had managed to create a plastic that was translucent, lightweight, odourless and tactile. By 1946 he had also invented an airtight “burping” seal inspired by an inverted paint can lid, which he then applied to the new plastic containers to create Tupperware. The innovative products were sold in department and hardware stores but weren’t popular – customers required demonstrations to understand what the products were and why they would use them. 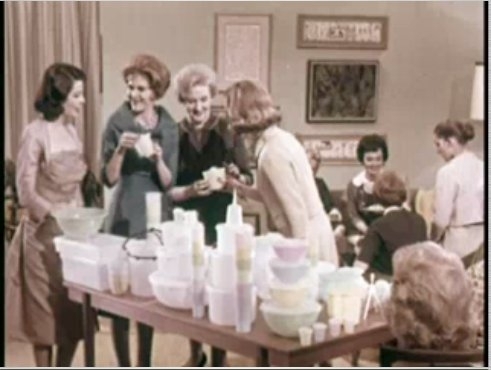 Tupperware was also being sold through private household product companies, including Stanley Home Products, some of whose salespeople were selling large quantities, in particular one Brownie Wise. The enigmatic Brownie Wise was outselling many of the other salespeople in the company and suggested that Tupperware would be suited to in-home selling parties, modelled after the marketing strategy used by Stanley Home Products. The parties would involve a housewife hosting the event with a saleswoman there to answer questions and play games - such as filling up Tupperware containers with grape juice and throwing it across a living room to test the airtight seal. Guests would then buy the products and were often be recruited to become saleswomen too. By 1950 Brownie Wise was elected to be vice president and by 1953 Wise had more than 10,000 women working for Tupperware and had doubled the sales of the previous year. The Tupperware party craze was sweeping the country and Wise became a celebrity, being featured in Life magazine and in 1954 was the first woman on the cover of Businessweek magazine. Tupperware and their parties are still hugely popular in America and around the world, although the UK market has never truly been won over by the brand. The company has expanded its lines in recent years, with a focus on its products enabling healthy eating, home cooking and being more environmentally friendly than disposable food packaging. Do you have an idea for a product that could transform the world of plastics? Our product design team will work with you to develop and test concepts and bring it to market. See how we worked with Hessiclip to develop an innovative product that is now seen around the world.